This morning I woke up and felt I had to get up immediately. For many reasons I should get up, one of them, being six o’clock, time to begin the day. Every morning the first thing I do is make the sign of the cross asking God to help, in dealing with the taxing action of coming out from sleep. I always find very hard to accept that sleep has ended, my brain is reluctant to leave the security of sleep and admit that I have to deal with a new day although, at the same time, it makes me feel full of thanks for such rest that allows me to face a new day. However, today I encountered, for the first time in my life, self consciousness reserve in the movement of my arm and hand, and a performance of the sign of the Cross with fear, joy, a feeling of company around me… On the one hand, there was my routine of many years, lifting up my arm, the moving of my right hand tracing the sign of the Cross over this body of mine, implanting on my person the strength of Christ. My consciousness was obliging me to go slow, stopping to think the overwhelming act of signing me with the sign of the Cross in the Name of the Father, and of the Son, and of the Holy Spirit. What had brought such paralysis to my veteran activity for entering a new day? Yesterday I had received, totally unexpected, from the Paraclete Press, the book THE SIGN OF THE CROSS, by Andreas Andreopoulos, explaining the origin and purpose behind the most universal gesture of the Christians. My paralysis of movement making over me the sign of the Cross was that, now, I was aware that this was not my routine way, giving strength to deal with my life, but that million of Christians, around the world, are doing and have done so for centuries as a gesture of blessing themselves, like I, in the morning, finding strength for the day. For the first time in my life I was self conscious of the great act of making the sign of the Cross. Each movement of my arm, the position of the fingers in my hand, going from my forehead to the breast, to my right shoulder and to my left shoulder, its rhythm, today, had become solemn and grandiose. I could not sign myself as usually but uniquely. I was aware suddenly that the sign of the Cross was everywhere, in my home, in the street, in buildings, etc. That was the reason why I could not simply sign myself but had to stop, rise, and, slowly and solemnly, sign in the Name of the Father, and of the Son and of the Holy Spirit. Today was not “the tradition that nobody knows how it started,” but an ontological act, the reason of my being, who and what I should be, better, who and what I am. This was why, this morning, my routine became so unique for me, as Andrea Andreopoulos also writes: “The symbol that combines simplicity and profound meaning to a greater extent than any other symbol is the sign of the Cross.” It is a prayer, interwoven with personal, social and family life activities, that “connects with some of the greatest Christian mysteries” The Incarnation, the Resurrection and the Second Coming. He also gives us the reason of this assertion, centuries before the fullness of time, man had been practising signing with meaning on the forehead. And it will be St. Augustine of Hippo who, at last, defined the value of the sign of the Cross, as the arriving to the fullness of time: the Cross of Christ (pag.21). Very complex indeed to enter on the semiotics of tracing blessings, by the Christian people, with the sign of the Cross for the last two thousand years! But, this author does so fascinating us with the figure of his priestly and venerable grandfather. It is, thus, that he gives the secret for transmitting Holy Tradition during two thousand years. He had already prepared our attention with that figure, when we began to read his book, on the first lines and pages of the first chapter. In this manner the venerable elder accompanies us, not only up to the end of the book, even, when we recollect the learning from its reading. Therefore, the author immerses us into the illuminating obscurity of the Holy Tradition. This one is not written, this one is not speculated upon, neither is expostulated. This one is experienced by those who do not live it. Those who live it are transformed by it. And, those transformed by Holy Tradition, become glorified in it. They have entered the realm of a new ontology. Millions of Christian around the world use the sign of the Cross-and have done so since the first century after Christ-as a gesture of blessing. It is practiced when alone, during worship, before sleep, upon waking up, before eating, before travel, and many other times throughout the day. But, what does it mean? Where did it originate? 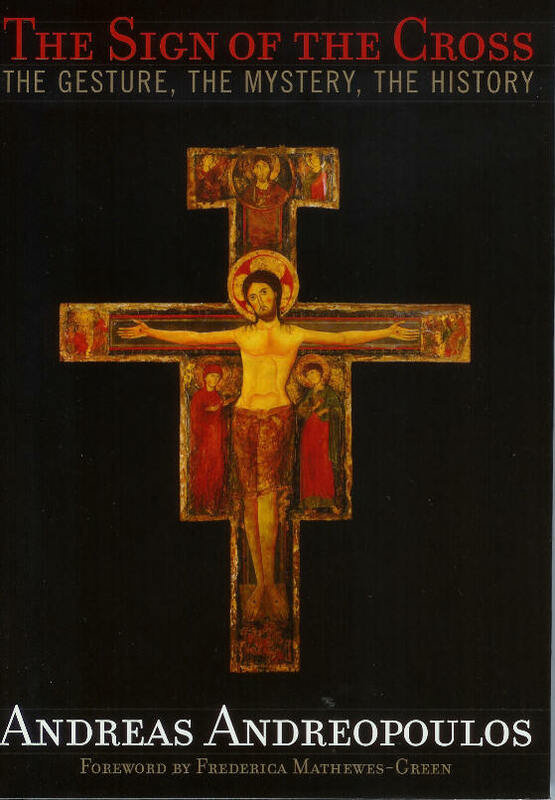 In The Sign of the Cross: The Gesture, the Mystery, the History (Paraclete Press / November 2006 / Hardcover / $19.95), Andreas Andreopoulos takes readers on a tour of the centuries from the time of Christ until today, uncovering layer after layer of history and mystery about the gesture that is literally a tracing of the Cross of Christ onto the body. This readable account will sacinate and inspire all who desire to know more about the inherited spiritual practices of everyday life. Andreas Andreopoulos was born in Greece in 1966 and is recognized throughout the world as one of the most eloquent young scholars of Christianity. He earned his Ph.D. in theology at the University of Durham and has taught in Toronto, Montreal, and Philadelphia. He is currently Lecturer of Christian Theology at the University of Wales.